Locke reads Sawyer's file and realizes how he knows his father. He goes to the beach camp and asks Sawyer to go with him by telling him that he had captured Ben and needed someone to kill him. Desmond & co. bring Naomi back to the camp and hide her in one of the tents, only they don't trust Jack, so they tell Sayid about her instead. 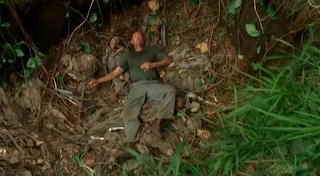 Locke heads through the jungle with Sawyer, and he takes him to the Black Rock. Naomi tells Sayid about the freighter that she came from that's currently off the island. She also tells him about the wreckage of Oceanic 815 that was found, along with all the passengers dead in the water. Locke and Sawyer reach the Black Rock, and Locke locks him in a room with his father. They get to talking, and Sawyer discovers who he really is. He makes him read the letter that he wrote to Tom Sawyer all those years ago, then kills him. Back at the beach camp, Kate finds out that Sayid and Hurley have a satellite phone, and then finds out about Naomi. She confronts Jack and tells her that no one trusts him which is why no one told him about Naomi. Locke tells Sawyer that he can go back to the camp, and tells him that Juliet is working for Ben, and gives him the tape recorder that Ben was using to give Juliet messages. At the Others camp, Locke shows up with his father's body, and demands answers. Ben tells Locke about Jacob, and Locke asks to see him. Mikhail comes running into camp and tells Ben about Naomi and the freighter. Locke forces Ben's hand and makes him take him to Jacob. The camp confonts Jack and Juliet about her undercover work for Ben, and Juliet tells them that she told Jack about it a few days ago. Locke and Ben arrive at Jacob's cabin, and go and visit him. The room starts to shake, Locke sees someone sitting in a chair and hears them say 'Help Me'. Ben realizes he heard him say something, and realizes Locke is a threat to him. He takes Locke to the mass grave that the Others had created for the Dharma Initiative and shoots him, and Locke falls into the pit. Ben leaves him there to die as the episode comes to an end. The episode runs 50:27 and is 404MB to download. You can stream the episode below (via Facebook), or go here to use torrents (better quality, recommended) to download the episodes to your computer. Haha, that's a good point, I never thought about that.